As editor of the online publication collectSPACE.com, I have attended my fair share of space shuttle launches. In fact, since 2005, I have yet to miss an astronaut crew depart for the International Space Station. My hope is to be present for all the remaining shuttle flights too, and if I succeed, then I will have been witness to 21 out of the 133 space shuttle launches over the course of the 30-year program. Witnessing 21 historic U.S.-manned missions to space is no small feat, especially when you consider that there are weather delays and technical scrubs to deal with during each and every launch attempt. But I am late to the game: There are more veteran reporters assigned by their publications and networks who have viewed double, if not triple, the number of launches I have seen. But no one’s record compares to that of Jay Barbree. An NBC reporter going on 50 years, Barbree has been there every time an American-crewed spacecraft has lifted off from Florida. At the time of this writing, he had covered 150 missions, from Alan Shepard’s historic 15-minute suborbital hop to Barbara Morgan’s multi-week journey. 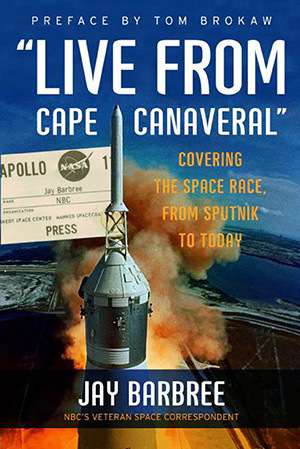 Barbree recounts this history in his latest book (his eighth), Live from Cape Canaveral: Covering the Space Race, from Sputnik to Today. Part memoir and part historical summary, Live captures the first half-century of space exploration through Barbree’s eyes and experiences, a history that he not only helped share with the world but in some small ways helped shape. And in turn, the space program helped shape his career. As Barbree recounts, on the October 1957 night that the Space Age began, with the Soviet Union’s launch of the world’s first satellite, he was working in radio in Georgia. Recognizing a good story when he saw one, he filed a report and then set his sights on the location of the burgeoning U.S. reply to Sputnik: Cape Canaveral, Florida. It wasn’t long before Barbree and his NBC colleagues were setting firsts. Using a modified pastry delivery van and more than 300 pounds of camera equipment, he was there for the first live TV broadcast of a space-bound rocket along with fellow NBC broadcaster Roy Neal. It was a bathroom break, however, that led to Barbree’s first real scoop, as he sat in a men’s room stall with his legs lifted off the floor to avoid detection, overhearing secret details of an upcoming launch. Though he couldn’t do anything with the information at the time, Barbree was ready to run with the story when Project SCORE launched a complete Atlas rocket into orbit, setting a record for mass and broadcasting the President’s voice to the world below. But Barbree’s story didn’t really take off until the first astronauts followed suit. Unlike today, when most of the media is largely kept at arm’s length from the space explorers after hours, Barbree knew the original seven Mercury astronauts as not just the subject of his coverage but as friends. He fraternized with them in between flights, was present when they pulled pranks—”gotchas”—on each other, and heard firsthand of their spaceflight adventures. Barbree’s affinity for the early astronauts is clear from the pages devoted to them in Live from Cape Canaveral. Nearly one third of the book covers their exploits in space and on the ground. Another third is dedicated to their and their colleagues’ later Gemini and Apollo missions. The last third accounts for the space shuttle era that followed, including the 1986 loss of orbiter Challenger and his own role breaking the story of its failed O-rings. You don’t get as far as Barbree did without mastering telling tales, and Live from Cape Canaveral is without exception. A quick and easy read, the book makes the last 50 years of spaceflight come alive with each chapter, in no small part due to his own recollections. For those who first experienced those years through Barbree’s NBC broadcasts, this book should offer a walk down memory lane while introducing new details that the television format of his early reports didn’t permit.